See Your CGOA Board Members! Ever wondered what your CGOA Board Members look like? Here's a photo taken at the annual member meeting at Chain Link. If we plan to attend any fiber-related conferences, we'll try to post that information here. You'll then be able to recognize us so you can come introduce yourself to us. We love to meet CGOA members anywhere! CGOA Board of Directors, l-r: Penny Sitler, CGOA Executive Director; Amy Shelton; Marty Miller, Vice President; Vashti Braha; Carol Alexander, Secretary; Rita Weiss, President; and Drew Emborsky. Not pictured: Treva McCain, Treasurer. Photo courtesy of Alexander Iannelli, whose wife Irene is a member of the Hooked on the Sound Crochet Guild chapter in CT.
Would you like to learn a little more about Marty Miller, CGOA Vice President? Check out this interview on Noreen Crone-Findlay's blog, Hankering for Yarn. The Consumer Product Safety Commission has just announced that yarn will be exempt from the rigorous lead testing and certification requirements required for children’s products under the Consumer Product Safety Improvement Act (CPSIA). Many crocheters, handcrafters, and others in the fiber-arts industry had been very worried about the effects widespread testing requirements would have had on manufacturers at many points in the yarn/fiber distribution chain. You can read more information on this ruling at www.apparelnews.net/news/manufacturing. The October issue of Yarn Market News will feature in-depth coverage of this breaking story. Thanks to various Chain Link attendees who submitted photos they took at Chain Link directly to CGOA/Offinger. We are happy to announce these photos will be available for viewing on or before September 1. Check here for links to the photo collections when they are available. At Chain Link in Buffalo, the CGOA Board of Directors proudly unveiled their newest project - which will benefit all new and renewing members this year. 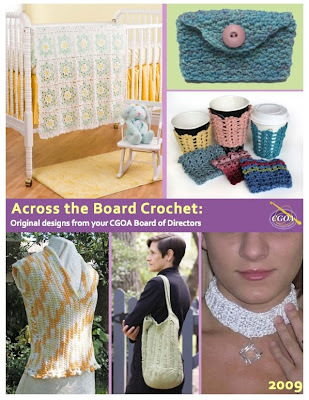 Most of the 2009 Board members contributed a pattern to Across The Board Crochet, a pattern booklet that will be available on-line (for free) when you join or renew your membership to CGOA! Six patterns, all designed by the CGOA Board - Carol Alexander, Amy Shelton, Vashti Braha, Drew Emborsky, Marty Miller, and Lorraine Lucas. As Carol said in her introduction, these are some of our favorite patterns to design. We had fun making this booklet for you, and hope you have fun making the patterns! Many CGOA members and Chain Link attendees have posted on their blog about their experiences at Chain Link 2009. We would love to read your thoughts! Please post a comment with a link to your blog post(s) about Chain Link 2009. Congratulations to all the winners of CGOA's 2009 Design Contest! $100 donated by DRG, Crochet! Chain Link attendees with flickr accounts, we have some exciting news for you! CGOA has a new CGOA flickr group. You're invited to upload any of your Chain Link photos to the group photo pool. Just upload your photos to your regular flickr account. Then visit the CGOA flickr group and select which photos you want to upload to the group pool. It's as easy as that! Here is a slide show of the photos currently in the group pool. We can't wait to see your photos added, too! What was your favorite part of the conference? What is your best conference memory? CGOA board member Drew Emborsky took some great photos of the Fashion Show that was part of Chain Link 2009's dinner banquet. We hope you enjoy this slide show of all the wonderful fashions! All photos copyright 2009 Drew Emborsky. Do you have a suggestion, comment, or question for CGOA's Board members? Send an email to CGOAblog AT crochet DOT org. We would love to hear from you! Members are welcome to contribute crochet-related articles, reviews, photos, YouTube videos, and links to their own blogs. Please send your submissions to: cgoanow @ crochet.org (to help us avoid spam, cut and paste address into your email program and remove spaces from "@"). 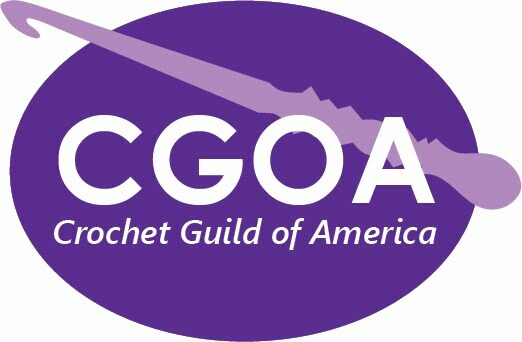 For more information on CGOA's Chain Link Newsletter, the official newsletter of our organization which is mailed to members as an insert in Crochet! magazine, email newsletter AT crochet DOT org.